It started on Friday, May 1st. My daughter, Catherine, showed up at the door to surprise me for my 60th birthday. We don’t get to see each other much since she lives in the D.C. area and I live in the Deep South. It was a great surprise and after I hugged her I said, “You came to see me on Derby weekend!” Of course her presence made my Derby weekend that much better. She learned to read The Racing Form when she was 8 years old. That’s when she first went to the track with her old man. Today, whenever I visit her we either go to a Baltimore track or we zip up to Delaware Park. When she visits me we open up the computers and play together via ADW or we may go to an OTB location 25 miles away. Many weekends we play long distance together and stay on the phone discussing races. The day she told me about my future son-in-law, Michael, the first thing she said was that he was a horseplayer, that he grew up in Maryland and his dad taught him the game. Even though I had yet to meet Michael, I told her to keep him. After all, how many horseplayers get a son-in-law that fits the same label? You can only imagine what it was like Derby weekend. We had the computers going and televisions on in every room in the house. We had racing information all over my (home) office and in the kitchen. I was tickled beyond belief to have Catherine and Michael with me. It got a little late Friday afternoon and we were discussing where we were going to dinner. I told everyone we had one more race and reminded them it was the Oaks. All of us got busy and, before long, my daughter and I both agreed on Lovely Maria. Catherine said she didn’t quite remember the rider, Kerwin Clark. I suspected that to be the case since she has never played Louisiana or Chicago racing very much, if any. I told her that “Boo Boo” had plenty of experience and his filly was a good one. She looked at me and asked, “What did you call him?” I explained that Clark’s nickname was Boo Boo, and that he was almost as old as me. Catherine shook her head and just laughed. And then she laughed even louder when I stood up and started screaming at the TV when Boo Boo and Maria took the lead in the stretch. “Win this one for us old guys,” I yelled as a determined Lovely Maria hit the sixteenth pole running like a champ. The whole family was laughing at me and that was okay, because the laughter was accompanied with high fives of victory. The next day we watched American Pharoah win the Derby. I must admit that I was not a Pharoah fan and the Derby left more doubts. 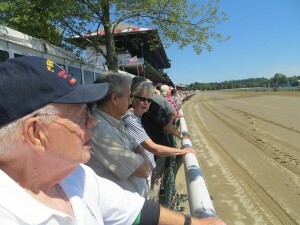 When Catherine and Michael left, we agreed to a day of long distance racing comradery when the Preakness rolled around. When American Pharoah got a quick lead in the sloppy Preakness, I knew he had a big advantage so the result was no surprise. While on the phone with Catherine she said that he looked awful good, but we both agreed that it would probably be a different world at “Big Sandy” (Belmont) in New York. Like many of you, I’ve seen the scenario too many times. A horse wins the Derby and the Preakness and then can’t win at Belmont. The first one my daughter remembers is her all-time favorite horse, Alysheba. She reminded me on Belmont day that I have seen three Triple Crown winners: Secretariat, Seattle Slew and Affirmed. How could I forget? I’ve seen the replays a thousand times. Catherine and I agreed to play Frosted with the hopes of spoiling the day and cashing a ticket. When American Pharoah got another easy lead and no one pressured him before the first turn it spelled doom for the field. I told my wife that unless “something is wrong with this colt he was winning the Triple Crown.” Too bad you can’t bet when they get to the first turn. When Pharoah crossed the line the phone rang and Catherine said, “Well, dad, I finally got to see a horse win the Triple Crown.” At that moment I accepted American Pharoah for the great horse he is. It may have been 37 years since I saw a Triple Crown winner but it had been an entire lifetime for my daughter. That made it all worthwhile. It’s been a couple of weeks since the Belmont and I have thought more about the last month or so. Our sport has a way of taking you back in history, getting you involved in present day, and always makes you think about the future. It affords us the opportunity to have a lot of fun, often with our friends and the people we love. This year we have an even greater opportunity to share this sport and reap the benefits that come with being a participant. We have a Triple Crown winner, a real hero. Now is the time to ask someone else to go to the track, or do something to promote the sport. Now is the time. We may not can wait again. Some of us have waited 37 years, others a complete lifetime. Did You Miss these Gems?